Silver Maple Leaf coin is minted by the Royal Canadian Mint (Royal canadian mint - RCM) since 1988. This term refers to the maple leaf, Canada's national symbol that is stamped on the silver coin. The coin contains one troy ounce of silver (31.1 grams of silver). Declared purity metal is sterling 0.9999. Guarantor of the purity of the silver Maple Leaf coin is the Canadian government. Maple Leaf coins have legal tender status, the nominal value of this silver coin is however only $ 5. As with the coin is, its nominal value is only a symbolic face value - real value of silver coin is made of precious metal value ​​and minting procedure and the premium is therefore much higher. Interestingly, the silver Maple Leaf coins mainly from 1996 and 1997 have a very high premium. 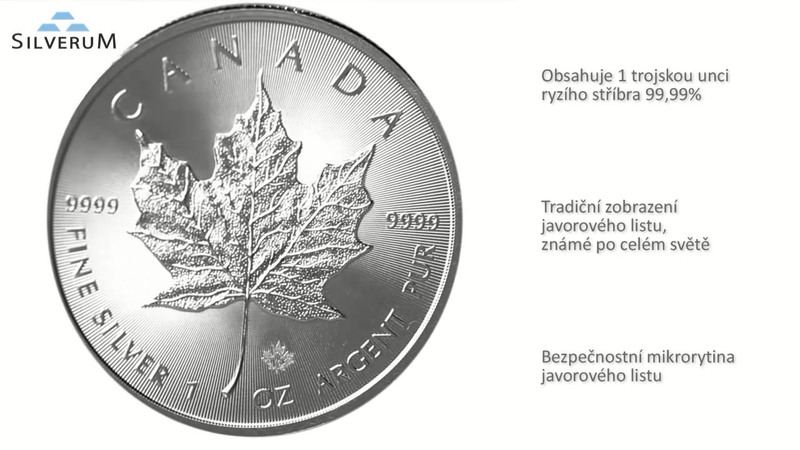 This is a limited number of Maple Leaf silver coins minted in these years: in 1997 was about 101,000 pieces minted, as for comparison - for example in 1999 there were over 1.2 million pieces of coins minted.